Lavender oil is the world's best selling essential oil and should be a staple in every family's home. Lavender oil is the world's best selling essential oil and should be a staple in every family's home. Lavender oils cooling, relaxing and uplifting effects have been cherished throughout the world for hundreds of years. It gives luster to the skin, balance to the body and happiness to the mind. For today's fast paced modern lifestyle, lavender oil is one of our greatest treasures. A quick drop on the hands with a deep inhalation can help to relax the worried or agitated mind. If you have children, lavender oil is a must. Use it in your home diffuser while the kids are playing or place a drop in their hands for direct palm inhalation before they leave the house for school. Our diffusers make the perfect nightlight for your child's bedroom. Diffuse the beautiful fragrance of this high quality lavender oil while they rest through the night! 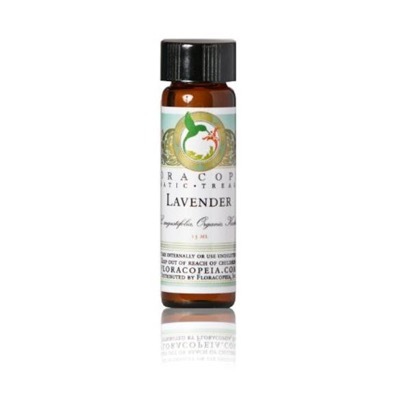 You will be hard pressed to find an oil that has put more smiles on more people's faces than lavender! Lavender oil is revered in folk traditions throughout the world for its profound ability to cool an overheated body. When used regularly, it cools feelings of anger, agitation and insecurity. Which lavender oil is best for me? Floracopeia is proud to offer a large selection of highest quality lavender oils sourced from diverse locations and distillers. To assist you in making your choice about which lavender oil might be the best for you, we offer the following information. A superior high altitude organic lavender oil that rivals the best French lavenders, this Kashmiri jewel is complex and sweet, with a lush, herbaceous bouquet. Our Kashmir lavender is grown in the foothills of the Himalayas, in high-altitude valleys famed for their rich harvests of aromatic and medicinal plants. Direct Palm Inhalation: Perhaps the easiest way to use lavender oil is through a simple direct palm inhalation. Place a drop of this deeply soothing oil in the palm of your hand, gently rub the palms together, bring them towards your face and take a deep inhalation....the benefits of lavender are immediate and obvious! Diffuser: To our knowledge, no one has ever complained about the fragrance of lavender! It is universally loved and almost always appreciated. Diffuse it in your home to relax and refresh the whole family. When you have guests over, their first comments are likely to be compliments on the fragrance of your home! Apply a drop to support skin health, including the soothing of insect bites. At nighttime, place two drops on a cotton ball and tuck under pillowcase before bed for an incredible nights rest. Add several drops to bath water to relax at the end of a long day. Blend lavender oil with any massage oil to uplift mood, and ease head and shoulder tension. According to the ancient healing system of Ayurveda, Lavender essential oil decreases all problems caused by Vata, Pitta & Kapha (the biological forces of wind, fire and phlegm). Therefore, by balancing 'wind', lavender oil will assist in slowing down the overly active mind and will support tranquility and peacefulness. By balancing 'fire', lavender oil will decrease the excess heat in the body and mind and will support clarity in the mind and brightness of presence. By balancing 'phlegm', lavender oil helps to lighten tendencies of sluggishness, complacency and melancholy. It's mood uplifting and supports heightened energy. Aromatic Profile & Blending for Lavender OilLavender oil's adaptability lends to easy, complimentary blending with most other oils, particularly floral and citrus oils. Some favorites include geranium oil, rose oil, chamomile oil, clary sage oil, and vetiver oil. Create your own relaxing lavender massage oil by blending lavender oil with a carrier oil such as marula oil. Lavender Oil Safety Guidelines:Non-toxic, non-irritating, and non-sensitizing. Do not take lavender essential oil internally. Modern aromatherapy as we know it owes its success in large part to the lavender plant. Though plants have been used, even in essential oil form, for millennia, the term aromatherapy was not coined until 1937 by French chemist and perfumer Rene Maurice Gattefosse. He was not a believer of the natural health movement, per se, but was interested in the properties of essential oils. After burning himself badly in his laboratory, he instinctively plunged the burned hand into the first available liquid compound, which happened to be lavender essential oil. It not only immediately eased the pain, but helped heal the hand without any sign of infection or scar. Thought to have been originally cultivated in Arabia, lavender may have been carried by Greek traders as early as 600 BC to the islands off the southern coast of France. A common belief is that the word lavender comes from the Latin lavare "to wash" because the Roman Empire routinely used lavender in perfumed oils for bathing. In The Story of Lavender, author Sally Festing states that the word lavender most certainly did not come from lavare but from the earliest spelled form livendula - Latin for "livid" or "bluish". The herb was also used in mummification processes in ancient Egypt, and was found in King Tutankhamun's tomb. It was a favorite for strewing on the floor, since it released an aroma when walked upon and it is often used these days in toilet water, as an insecticide or in sachets to be placed between linen. Lavender is the most popular, and therefore the most adulterated, of all essential oils. It is estimated that 90% of all products labeled "lavender essential oil" are either other species (such as lavandin), diluted, or are outright synthetic fabrications. True lavender grows at high altitude of above 2,000 ft. Native to the Mediterranean region, it is now cultivated on every continent.